“I am a God, the prime being. I shall impale you on the crumbled pillars of the millenia“. Not just fighting words; Timeghoul‘s demos go a long way, perhaps farther than any death metal band in history, in capturing the awesome appeal of infinity germane in those words. A rough, low-budget aesthetic, rather than repelling sensitive ears, instead, through force of composition, focuses the attentive ear on the many idiosyncrasies, intended or otherwise, to be savoured here. Mockery of Judeo-Christian theology is inherent in the Incantation sound and theme. Onward To Golgotha remains untouched in savagery in the death metal canon. A suppressed production gives these songs the blurred-edge power of suggestion which dark alleys and nightmares possess. 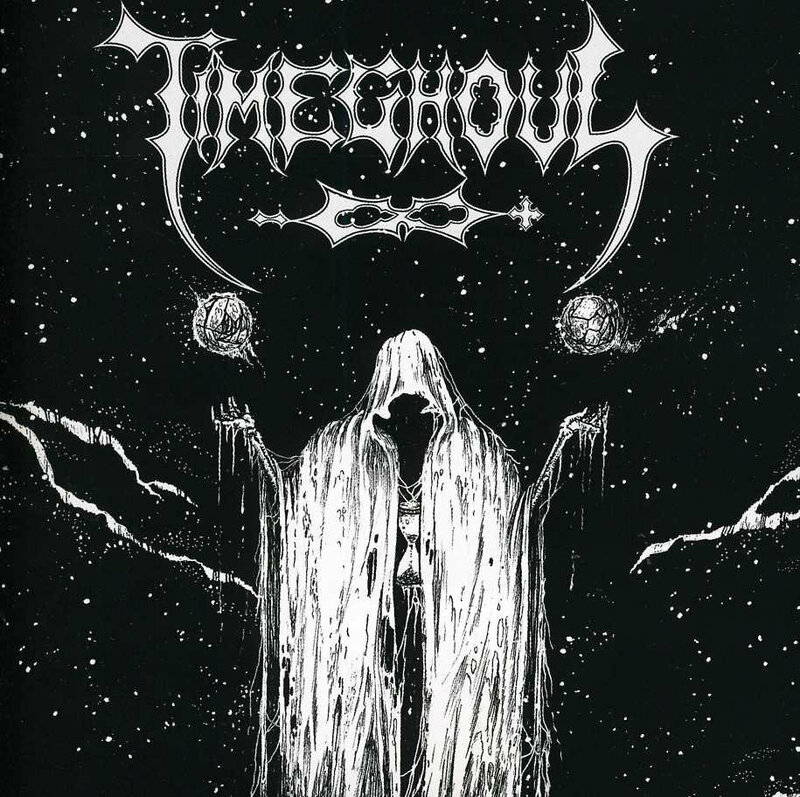 These Timeghoul recordings are taken from a short period between 1992-1994, but have achieved near-unprecedented resurgence in fame through the compilation released by Dark Descent Records. Hailing from the American Midwest, known for its fiercely individualistic take on death metal (see Order From Chaos, Phantasm, Xenomorph, Cianide, Impetigo), Timeghoul were without doubt the most daring visionaries of them all. Technically, the six songs found on this compilation exist at the crossroads between extreme speed metal and the nascent death metal scene, a time of hybridization and coagulation rife with adventure like no other. Timeghoul, however, were a songwriter’s band, in the sense that there are virtually no stand-out riffs to be found here; not for lack of quality either, but because Timeghoul consciously subordinate them to the song. Rarely if ever returning to a phrase that has passed on in the song’s lifecycle, Timeghoul establish their expansive, ever-evolving agenda from the outset. The band’s sense of drama is immense, and all the physical-musical repertoire at their disposal is placed in the service of this theatrical inclination. By this is meant a continuous employment of music as harmonic knowledge; a wide breadth of the guitar neck is used for intricate harmonic interplay, with an unorthodox, frequently widely-dispersed approach towards intervals. The drums fill in as the rhythmic analogue of this dexterity, mirroring riffs and vocals in flow and emphasis, but not just; endlessly inventive, they switch and mix up patterns, even during iterations of the same riff-set, and take it upon themselves to pull songs out of strategically placed low spaces. Timeghoul make fine use of silence and slow tempos, a tool misunderstood by much of metal. The quivering voice of a wraith ministers tales of dark fantasy and science fiction during these lulls; on other occasions, the lead guitar picks up the thread immediately preceding the drop in intensity, working in near-contrapunction with the progression underneath. In all events, the tendency is one of an operatic soaring towards the unknown, appropriately paralleling the cosmic magnitude of these songs. 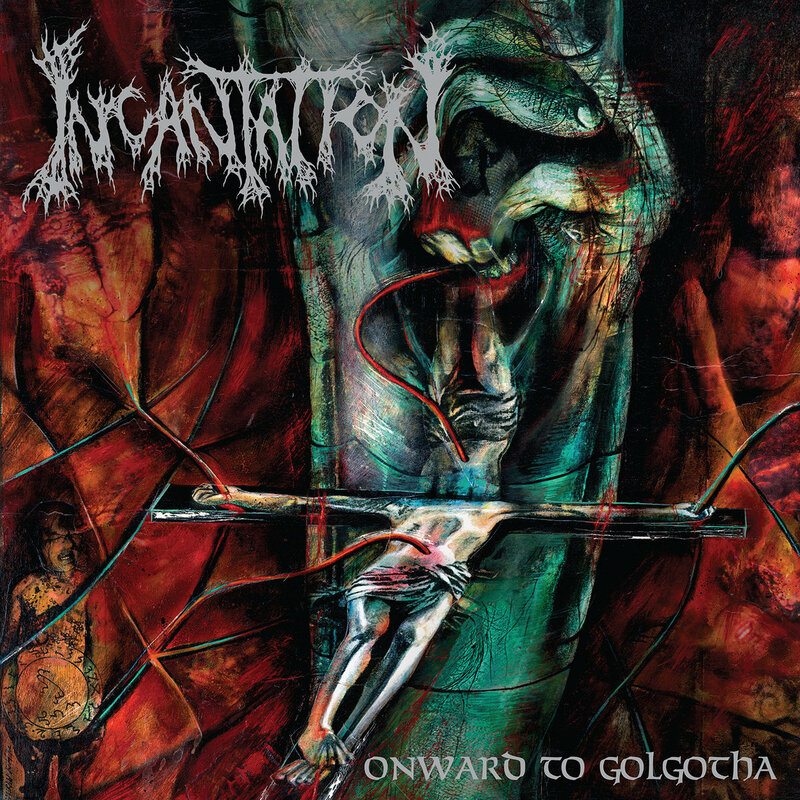 Incantation‘s pre-Onward To Golgotha history contains such storied names as Paul Ledney and Will Rahmer who, in their incarnations in bands like Havohej, Profanatica, and Mortician, would continue carrying some elemental figment of their one-time participation in this great project. Along with Immolation‘s Dawn Of Possession, Onward To Golgotha presents the irreconcilable split of death metal from the speed metal that formed the genetic material of its creators. The Incantation sound as a whole is based on dissonant atonality. One reader posited an interesting question on the difference between the two; to me, atonality is a song-wide enterprise, rebelling against tonal shackles. Dissonance, on the other hand, is a subset of atonality, more like an ornament which bands can use to create dislocation at the micro-level. Incantation combine both dissonance and atonality in a massively unsettling proportion to create what, for all intents and purposes, is the sound of death metal. Incantation have a single voice of expression. Harmonic interplay, except for the brief, chaotic guitar lead or mood-embellishing synth, is frowned on; instead, what we hear is a riff style neatly bifurcated into (a) call-response, and (b) open-ended or unresolved. The first of these is very much like a question-answer dynamic, where the riff is split in two halves, one ending on an inquisitive note down the octave, the other retreating back towards the original tonic, often punctuated with harmonics, to hint at a vehement closure. (b) is best heard on the iconic opening riff to ‘Golgotha‘, that contorts and unravels without any discernible goal in sight, but the goal is revealed in the journey itself, so fluid are its transitions that the line of severance becomes all but invisible. Incantation work at three clearly delineated tempos: rapid, 16th note-picked tremolo passages, a slower, down-picked power chord chug, notes of said chord frequently arranged in dissonant configuration, and an even slower, outright dirge. The Incantation template is such that it allows little deviation from these markers, but within these markers, and through sheer violent explosiveness of riff quality, they succeed in crashing those limitations to the ground, and raise a monument of genuine, extreme inspiration for following generations. Onward To Golgotha is death metal, something which can’t be stressed enough. It is still the first album I run back to after an extended absence from extreme metal, whatever discrete and predictable nature it possesses instantly papered over with its intensity and progressive narratives. Its influence on death metal, generally good but of the last ten years, mostly bad, is undeniable. Timeghoul‘s music, on the other hand, like a friend says, is an internet phenomenon, albeit belonging to the same era as Incantation. But its being an internet phenomenon isn’t something that can be held against it in right earnest. Its virtues are many and manifest, aspiring to the most exalted ideal of death metal that we continue holding precious. Onward To Golgotha is the greater album, but Timeghoul‘s set of recordings is better. This entry was posted in Death Metal and tagged Dark Descent Records, Death Metal Battle Royale, Discography, incantation, Onward To Golgotha, Timeghoul. Bookmark the permalink. If OtG actually loses in the first round (as it looks like may happen), then a majority your readers must be literal retards. haha, final vote rests with me, SO WE WILL SEE!